Liposuction is Most Popular Cosmetic Surgical Procedure in the U.S.
Home » Blog » Liposuction is Most Popular Cosmetic Surgical Procedure in the U.S. According to the latest statistics from the American Society for Aesthetic Plastic Surgery, liposuction was the most popular cosmetic surgical procedure in the U.S. in 2013, surpassing the second most popular procedure, breast augmentation, by more than 15 percent. These figures represent a trend reversal, as breast augmentation has been the most popular procedure in recent years. When broken down by age group, liposuction was the most popular procedure among adults age 35-64. Younger adults underwent more breast augmentations, older adults more facelifts, and for children the most popular procedure was otoplasty (ear pinning). 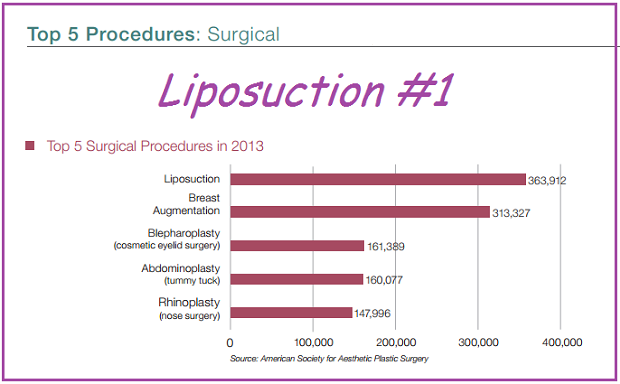 Statistics can’t tell us exactly why liposuction was the most popular procedure of 2013, but we can make some assumptions based on the data. First, the age groups listed above are telling, but hardly surprising. Liposuction is generally not appropriate for children, so it makes sense that it would not be the most popular procedure in the 17 and under age group. Also, the ears stop growing fairly early in children, so they can actually undergo otoplasty. We can apply similar logic to adults 65 and over. Older patients tend to dress more conservatively and be more concerned with the signs of aging on their faces, making the facelift the logical frontrunner among this age group. These patients still often undergo liposuction, just in smaller numbers. The number of liposuction procedures jumped 16 percent from 2012, whereas breast augmentation went down over 5 percent. This trend is harder to pin down, but it seems that more people these days are valuing a trim, fit figure over large breasts. As our society has become more health conscious, it makes sense that more people would be drawn to the slimming effects of liposuction. If the trends are any indication, this procedure is sure to remain among the top cosmetic surgical procedures in the U.S. for the foreseeable future.